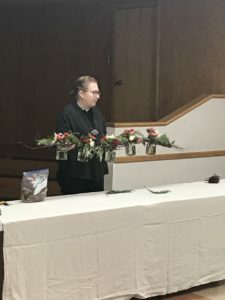 December 2018 The Gardenzette is here! Posted in Uncategorized| Comments Off on December 2018 The Gardenzette is here! RSGC’s next general meeting is November 15, 2018 10:00 a.m.
Posted in Uncategorized| Comments Off on RSGC’s next general meeting is November 15, 2018 10:00 a.m. The business portion of our meeting begins at 10:00 a.m., followed by a break to visit our horticulture and design exhibitions, our Ways & Means display, and visit. At 11:00 a.m. our program begins with an exciting design presentation, followed by lunch. Our speaker, Ellen Seagraves, will demonstrate the high style that defines her Chic Floral Designs in Bethesda, MD. 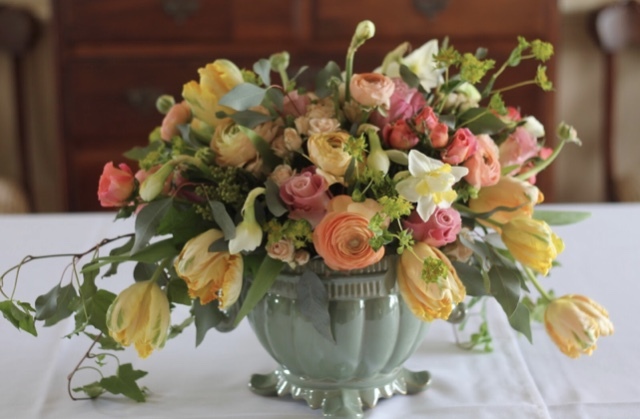 She will create an evolving tablescape, showing how one can elaborate on a theme from one great arrangement, adding in more and more, to create something fantastic. 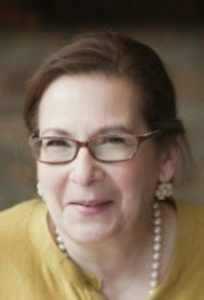 Ellen has a BFA in Weaving and Textile Design and often incorporates elements of those disciplines in her work along with Ikebana. Her arrangements have graced the White House and the Blair House among other prominent addresses. November 2018 The Gardenzette is hot off the press! Posted in Uncategorized| Comments Off on November 2018 The Gardenzette is hot off the press! Holiday Floral Design Pumpkins – We are taking orders now. Posted in Uncategorized| Comments Off on Holiday Floral Design Pumpkins – We are taking orders now. It’s that time of year! 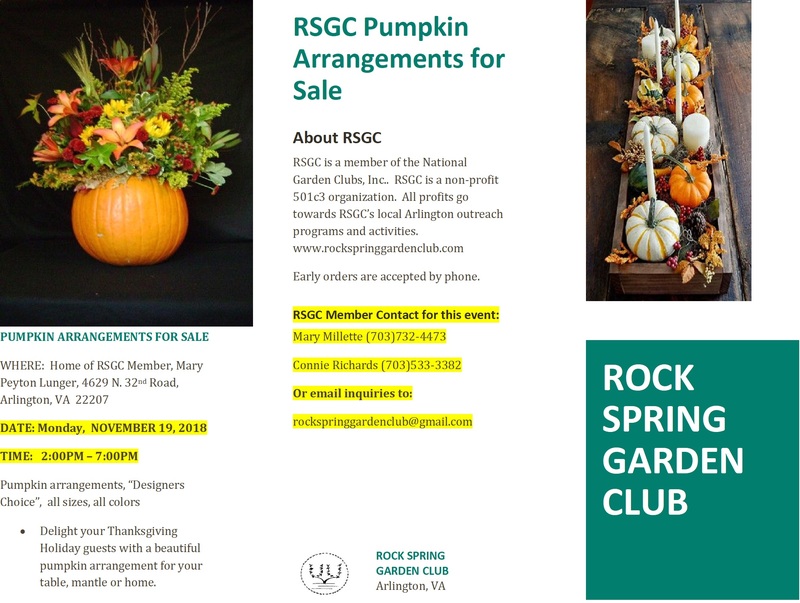 Rock Spring Garden Club members are busy creating holiday floral pumpkins for sale to our friends and neighbors in time for your Thanksgiving and holiday get togethers. Just use the contact button, email us or call. See details below. October 2018 The Gardenzette is hot off the press! Posted in Uncategorized| Comments Off on October 2018 The Gardenzette is hot off the press! The Gardenzette for June 2018 – Have a wonderful summer! Posted in Uncategorized| Comments Off on The Gardenzette for June 2018 – Have a wonderful summer! Our June general membership meeting will be held at 10:00 a.m. at Bon Air Park. And yes! GUESTS and individuals interested in joining Rock Spring Garden Club when our meetings start up again in September are very welcome as well.